5 Times You Should Call an Arborist | Mr. Tree, Inc.
Few things in life are better than having trees on your property. When properly cared for, they provide shade, fruit, a place for children to play, and they can even boost the value of your home. On the other hand, a tree that has not been cared for regularly can become unhealthy and pose a risk to your family and property. Trees require regular attention and, when they become sick or injured, they can also require intensive care. If you are resourceful, you can often solve problems that occur with trees on your own. However, there are also times when it’s best to call a professional arborist. An arborist is a person who has been trained in the service and care of trees. They are extremely knowledgeable about tree care and can help you keep your trees safe and healthy for many years. While you can often trim the leaves of smaller trees yourself, it’s best to call in a professional once your tree has grown large enough to require a ladder for trimming. As the branches get larger and heavier, they can become potentially dangerous if they are not safely removed. Pruning large trees usually requires specialized equipment; the person doing the pruning may need a chainsaw, hard hat, and ropes to guide heavy branches to the ground safely. Aside from the obvious safety requirements, arborists are trained in the best practices for pruning trees based on their individual health and particular species. 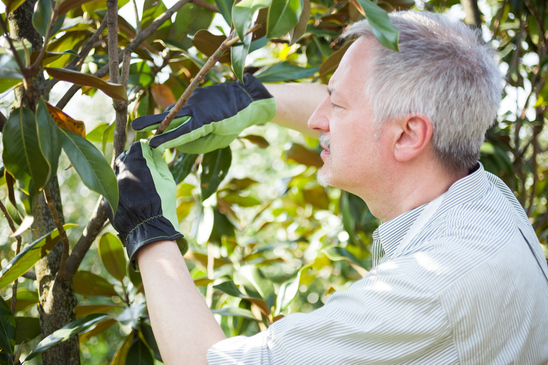 Over-pruning (or under-pruning) a tree may be detrimental to its health, so if you are in doubt, contact a professional to advise you on the best course of action to take. You will definitely want to secure the services of a professional if you are planning on planting a new tree or trees in your yard. A tree is an investment that can last for many decades, so you’ll want to make sure that you start off on the right foot. Young trees can be vulnerable to environmental factors, overwatering, and any number of other threats, and an arborist can take steps to minimize these issues. They can also advise you on what the best species of tree to pick for your particular soil and climate are. Depending on the type of tree you choose, an arborist can also give you care instructions suited to its unique needs and help ensure that it grows up healthy and strong. Even more difficult than planting a new tree is removing an old one. If a tree has become sick or dies, you will want to make sure that it is removed from your property as safely as possible. Sometimes you may not be sure whether a tree needs to be removed or not. An arborist can advise you if a sick tree can be saved or if it is in danger of spreading its sickness to other trees or damaging your property. If it turns out that you do need to remove a tree from your property, then your arborist can do that safely as well. Felling a tree without damaging property is a skill in and of itself. The tree will need to be guided downward past any structures or other trees. After cutting down the tree, an arborist will make the disposal process much simpler as well. They can take the fallen tree off of your property for you and save a great deal of hassle in the process. Environmental threats to your tree can come at any time of year, and it helps to be prepared. An arborist can assist you in making sure your tree is protected from the worst that nature has to offer. For example, lightning strikes are capable of seriously damaging trees and even starting fires. An arborist can advise you if your tree is at risk and help to install lightning protection around your trees. They can also help you prevent insect infestations, sun bleaching, fungal diseases, and help keep wild animals from eating your tree. Ask your local arborist for a consultation to find out what, if any, protection your tree needs from the elements. Sometimes a tree can become damaged unexpectedly, and if that happens, it’s best to contact a professional to safely deal with the problem. If, for example, a large limb begins to crack, it may need to be removed safely. Heavy winds can thrash trees and leave them in need of some emergency care. Occasionally, trees may begin to grow (or fall) towards hazardous areas like power lines. You should always have a professional assess what to do if there are power lines or any other dangers nearby. A trained arborist can safely take care of the jobs that are too dangerous to do yourself.